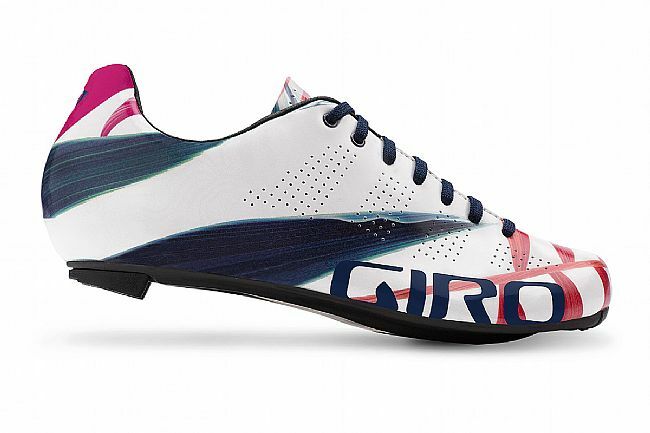 The Giro Women's Empire ACC Road Shoe pairs a classic look with modern technology, for a high-performance cycling shoe that looks as good as it feels. The revamped sole is full carbon, made of Easton's race-tested high-end EC90™ ACC carbon. The ultra-low 6.5mm stack height provides a direct, confident connection to the pedals, and the adjustable SuperNatural Fit footbed allows for fine-tuned fit and arch support, so that when it counts, you won't be thinking about your feet at all—just about how good standing on that podium is going to feel. The classic laced closure on the Women's Empire ACC is intuitively adjustable and looks great, too. The Evofiber™ microfiber upper is highly breathable. Heel pads are replaceable. Claimed weight: 210 grams (size 39). Compatible with three-bolt road cleats.